You will find our 3x5 playhouses here. Their compact size makes them perfect for smaller gardens, but you can still give your kids their own house to make lots of memories in. The Tigercub Hideout House features a stylish window complete with safety glass and ultra safe hinges with a rubber protector. 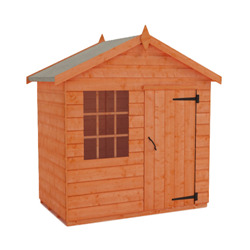 Our playhouses are made from high quality tongue and groove.